This article is about the first game in the Mario vs. Donkey Kong series. For the series itself, see Mario vs. Donkey Kong (series). 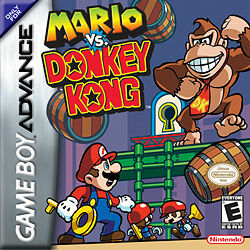 Mario vs. Donkey Kong is a game for the Game Boy Advance. It brings back Mario and Donkey Kong's rivalry from the Mario franchise's first game, Donkey Kong. 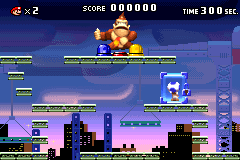 The game is more or less a spiritual successor to Donkey Kong for the Game Boy, as it features the return of many original elements such as the construction site setting, Mario's athleticism, and using the hammer, and borrows elements from Super Mario Bros. 2, especially with picking up enemies and items. Despite bringing elements from previous platformers, Mario vs. Donkey Kong is more of a puzzle platformer; Mario must find the best route to complete the level by hitting switches and interacting with other objects, often in a specific order. This game spawned multiple sequels and became its own series; this is the only game in the series, however, to feature Mario himself as a playable character since the later games have the player control Mini-Marios. Mario vs. Donkey Kong was re-released as a free downloadable title for the Nintendo 3DS on December 16, 2011. However, it was only available to people who purchased a Nintendo 3DS prior to the August 12, 2011 price drop, meaning they had to be a part of the Nintendo 3DS Ambassador Program. Mario vs. Donkey Kong was re-released again on the Wii U's Virtual Console in Japan on July 23, 2014, in Europe on September 17, 2015, in Australia on September 18, 2015 and in the Americas on February 9, 2017. Mario has become so famous and popular in the Mushroom Kingdom that he has decided to establish the Mario Toy Company, which has developed a new toy called the Mini-Mario. As Donkey Kong surfs through the channels of his television set, he sees a commercial for the Mini-Marios. Donkey Kong instantly adores the toys and heads to the Toy Store, but finds that they are sold out. Donkey Kong turns around and sees the Mario Toy Company, deciding to loot the store. The store is managed by Toads, but they do nothing to stop Donkey Kong from stealing the toys. Mario then notices Donkey Kong and starts chasing him. After Mario chases Donkey Kong for a while, he eventually checks his bag, only to see all the Mini-Marios he stole have dropped, with Mario, the toys, and the three Toad employees laughing at him. Enraged, he grabs the three Toads, climbs the building, and Mario rescues the three Toads while fighting Donkey Kong. Upon his defeat, he falls off onto a truck full of Mini-Marios and steals thirty-six more, now with keys attached. Mario gives chase once again, until a similar cutscene occurs in which he checks the bag again. Only Mario laughs until six Mini-Marios come out. Donkey Kong then grabs the Minis with a giant robot, to which Mario promptly frees while fighting Donkey Kong, eventually wrecking the machine and electrocuting Donkey Kong in the process. After that, Mario is about to scold Donkey Kong for what he did, but finds that Donkey Kong is crying in pity and shame. Mario cheers him up by giving him a free Mini-Mario. Donkey Kong gets what he has wanted all along while Mario and the remaining Mini-Marios celebrate. Each of the games six worlds is divided into eight levels. 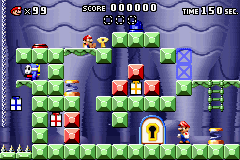 For the first six levels within each world, Mario must find a key and open up a door to the second half of the level, which is a checkpoint. There, Mario will find the toy that Donkey Kong dropped. If Mario is defeated in the second half of the level, his points reset back to the way it was in the first half of the level. 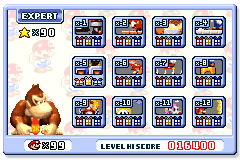 At the beginning of each level, there is short sequence showing what Mario needs to do or what he may face before playing the level. This short sequence also explains what moves Mario needs to use to complete the level, showing some button combinations. Unlike other Mario games, when Mario takes a hit, he loses a life. He can also lose a life from getting squished and falling on from a great height and landing on his head. If the fall is not big enough, Mario may get stunned on his back instead. There is also a time limit, which is similar to the traditional Super Mario Bros. games; if the time limit is low, an alarm plays and Mario panics. If the time limit runs out, Mario loses a life. The remaining time in the first area will be added to the time limit in the second area. 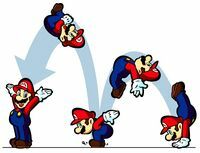 Unlike other Mario games, Mario has more moves besides jumping, such as handstands and backflips. 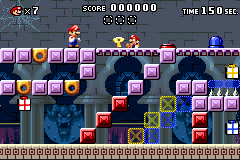 To defeat enemies, Mario must pick up objects and throw them at enemies, reminiscent of Super Mario Bros. 2. 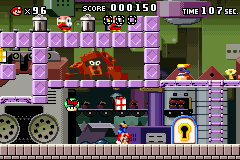 Throughout the level, there are some collectibles Mario can collect. Three are pivotal in earning a high score, which are different colored presents. Earning a high enough score, beating the default score, earns a star for that level. The stars later are used to unlock Expert levels. 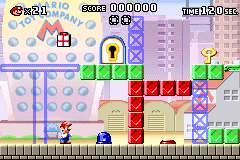 Once Mario completes a level and collects enough presents, he can play a short minigame to earn extra lives. One present may have a 1-Up, one may have a 3-Up or 5-Up, and one present may have a Donkey Kong head; this is shown at the beginning of the minigame. One minigame is stopping a scrolling arrow on top of the desired present while the other has Mario swapping presents so Donkey Kong's fist squashes an undesired present. 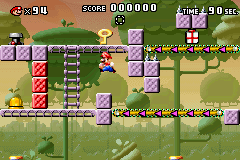 The seventh level in each world is a Mini-Mario level. Mario leads the six Mini-Mario toys he collected back to their toy box; however, he must make sure they avoid obstacles along the way. This leads into a battle with Donkey Kong, with each Mini-Mario saved becoming a "hit point". For example, if Mario saves all six of the Mini-Mario toys, he'll be able to be hit six times by Donkey Kong before losing a life. If Mario runs out of time or loses all of his hit points, the player will lose a life and will fail to defeat Donkey Kong. The player will need to retry the level in order to proceed. If the player doesn't do the Mini-Mario level, Mario will start the fight with four hit points. After Mario has beaten the six worlds and defeated Donkey Kong, six "Plus" Worlds are unlocked, numbered 1+, 2+, and so on. There are seven stages in each Plus Worlds, and there are no Mini-Mario levels. Mario must get to a Mini-Mario holding a key and lead it to the exit doorway. If Mini-Mario is defeated, the player will lose a life and restart the level. There is only one part per level in the Plus Worlds, and they are designed to be more difficult than the main worlds. There are still Donkey Kong boss levels in the Plus Worlds. In those levels, the player always starts with six hit points and has 120 seconds to defeat Donkey Kong except in Donkey Kong Plus, where they have 300 seconds. For the "Expert" levels, a certain number of stars collected by beating high scores are required to unlock levels. There are twelve Expert levels. Additionally, restarting or leaving the level in any mode before completing it the first time will result in the loss of a life. 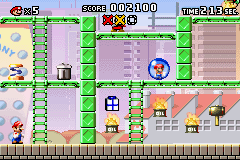 If the level is already complete, the player will not lose a life when choosing to exit the level. However, the player will still lose a life if they retry the level, even if it is completed. - Pauses and continues game. The first world, where Donkey Kong stole the Mini-Mario toys. This world features Garbage Cans, Shy Guys, and a few other gimmicks. Donkey Kong's next stop, featuring ropes, Monchees, Snapjaws, and more. 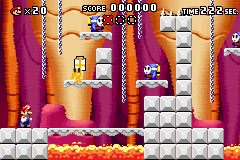 An area with high volcanic activity, featuring Lava Bubbles, Firebirds, and Shy Guys equipped with blowtorches. A haunted mansion, featuring Boos, Polterguys, Thwomps, and others. 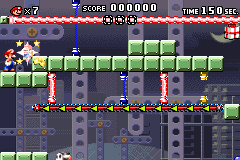 A forest world featuring mechanical elements such as Bob-ombs, Conveyor Belts, and other gimmicks. An ultramodern city featuring robotic Monchees and lasers. The final boss stage in the main part of the game, set apart from other worlds. 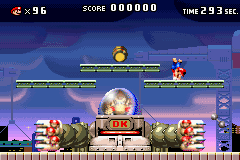 The final boss stage of the game, where Mario confronts a mech-piloting Donkey Kong. The Expert levels are a group of twelve levels that test the player's skills. In order to beat them, the player must find a key and go through the door. These levels (save for boss levels and the regular worlds' final boss) are the only levels that don't involve Mini-Marios. They are first unlocked by beating the true final boss then by stars obtained. There are no set high scores for these levels and collecting all three Presents in a level does not let the player play one of the minigames. The music that plays during the Expert levels is also sped up. The title of this section is official, but it comes from a non-English source. If an official name from an English source is found, the section should be changed to its appropriate title. These are the only released cards in existence, and only in Japan. Card-e+ (カードe+) is the name of the mode to play e-Reader level cards, but only in the Japanese version. The mode is hidden by default, but can be enabled by connecting a second Game Boy Advance with a link cable and following the promptsMedia:MvDK e-Reader Instructions.png. 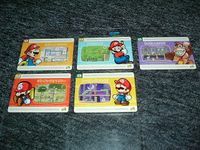 Only the first five cards were officially released in Japan for a very limited run. This mode exists in the North American version, named e World, but no cards were released. However, remnants exist in the game's code. 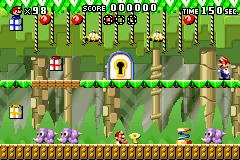 Key Keys are found in the first half of every regular level of the game. They must be taken to locked doors in order to open the second half. Mini-Mario Mini-Marios are the objective of the second half of the normal levels, where they must be rescued from crystal balls. They follow Mario in Mini-Mario levels. 1-Up Mushroom 1-Up Mushrooms give Mario an extra life. Switch Switches are found in three versions: red, yellow and blue. As the main effect, the switch that is active makes platforms, blocks and ladders of the same color available to use. Spring Springs help Mario to jump higher. Conveyor Belt Conveyor Belts appear in mass in some levels. They are used to transport keys and to help Mario through narrow areas. Their direction can be changed with a switch. Donut Lift Donut Lifts are platforms that fall down if Mario stays too long on them. Elevator Elevators are found moving on lines. Their directions can be changed with a switch. Barrel These items can be carried and thrown by Mario. He can use them to defeat certain enemies, or as auxiliary platforms to reach other platforms or to pass long gaps with spikes. Hammer Hammers are found floating on platforms. Mario can use them to defeat enemies, such as the Oil. The can be thrown upwards and grabbed again while in the air. Present Presents are found in red, yellow and blue variations. They are used to a bonus game in the end of a level, as well as opening the Plus Worlds. Letter The letters T-O-Y are found in Mini-Mario levels. They must be collected by Mini-Marios to open the toy box. Toy box Toy boxes are the goal of the Mini-Mario levels. If the letters T-O-Y are collected, it opens and allows Mario to drop off his Mini-Marios. Bob-omb Bob-ombs are dropped by some dispensers. They fuse up when Mario is near and explode moments later. Boo Boos appear in Spooky House. They chase Mario while he is not looking at them, and cower while being watched. Brickman Brickmen are placed on platforms. They throw three lines of bricks under them, forcing Mario to handstand to avoid being hit. Candle Candles appear in Spooky House, where they have the ability float up and down. If Mario touches one, he gets burnt and loses an extra life. Cannon and Cannonball Cannons tilt up and down, shooting cannonballs. Falling Spike Falling Spikes fall from ceilings when Mario gets near them. They can also get stuck on the ground, and turn into platforms to the player. Fire Fires walk from side to side on an area. They burn Mario once they touch him. Firebird A flaming Nitpicker that appears in the Fire Mountain world. Garbage Can Unknown enemies hide inside Garbage Cans to confuse the player. They reveal themselves if Mario hops on them, they will start walking. Mario cannot grab and throw them as ordinary Garbage Cans, but rather use them as moving platforms during their motion. These creatures can be downed by throwing some object at them. Katakata Kaen Heihō Katakata Kaen Heihō are found in Fire Mountain. Besides walking from side to side, they also blow fire that can harm Mario. Katakata Spanner Heihō Katakata Spanner Heihō appear in Twilight City. They attack by throwing spanners at Mario. Katakata Yarihō Katakata Yarihō are firstly seen sleeping. Once Mario gets near them, they wake up and start running after him. They go back to sleep if they touch a platform's edge. Kōmori Kōmori are bat enemies that, once released, fly horizontally through the stage. If they touch Mario, they latch on to him, causing him to fall from the rope he is climbing. Kurasshā Kurasshā fall from the ceiling, just like Thwomps. However, they keep falling even if Mario is not near. They can be used as platforms. Lava Bubble Lava Bubbles are found jumping out from lava. They can burn Mario in one touch, and cannot be defeated. Lava Geyser Lava Geysers rise out of pits of lava and cause platforms to float on top of them, allowing Mario to reach higher ground. Monchee Monchees are mechanical monkeys with long tails that hang below the platforms they are on. Mario can use these tails as ropes without getting harmed. However, he still loses an extra life if he touches a Monchee's body. Ninji Simple enemies that jump up and down, which can help Mario to reach higher areas. They are invincible. Nitpicker Nitpickers are small birds that float horizontally once they leave their nests. They also drop polka-dotted eggs at Mario. Oil Oil is found in cans with "OIL" written on their sides and fire coming out of them. They move up and down and burn Mario if he touches them. Polterguy Polterguys move from side to side. There are three variations of this species: blue, red, and yellow. If a switch of their respective color is pressed, they turn into stationary blocks. RamRam RamRams are found in jungle levels. Despite being enemies, they are used as platforms a few times. They can be defeated by fruit or by collapsing with another enemy or with an object. Robokikki Robots that act similar to Monchees, but move faster. Shy Guy Simple enemies that move side to side continuously. Sir Shovalot Sir Shovalots, stubby knight-like enemies, are firstly seen walking calmly on the ground. But once they spot Mario, they quickly move towards him and use their front armor to shove him. This can be harmful if Mario finds himself between the armor and a wall, but it also helps him go through narrow places. Sir Shovalots cannot be defeated in any manner. Snapjaw Snapjaws are seen climbing ropes in forest levels. They can be only defeated by falling fruit. Sparky Balls of electrical energy that move across wires. Tane Pakkun Tane Pakkun are found stationary on platforms, usually near ropes. They spit seeds to harm Mario. Thwimp Thwimps jump from side to side, trying to crush Mario. They are invulnerable. Thwomp Thwomps watch the ground and try to crush Mario if he walks under them. Switch-controlled blocks can be used to prevent them from reaching the player. If Mario touches them in any kind, including standing on top of them, he will lose a life. Donkey Kong Donkey Kong is the only boss of the game, fought in every world. In each of his fights, he attacks Mario in a different manner. The game was initially planned as Donkey Kong Plus, an updated version of the Game Boy Donkey Kong. The only known difference between the original and Plus, aside from the graphics, was the addition of a level designer to be used through the Nintendo GameCube for players to create their own levels with. However, the game vanished the following year, and was replaced by Mario vs. Donkey Kong, with the level editor gone and the graphics replaced with pre-rendered graphics. However, the game's sequel, Mario vs. Donkey Kong 2: March of the Minis had this feature and took advantage of Wi-Fi Connection. Mario vs. Donkey Kong is one of the few Mario games to be developed by an American team, Nintendo Software Technology Corporation (NST). In NST's team, Shigeki Yamashiro is the producer while Yukimi Shimura is the director. Wing S. Cho designed the game and Yoonjoon Lee is the engineering director. Mario vs. Donkey Kong is generally well-received by critics, aggregating an average of 81/100 on Metacritic and 79.07% on GameRankings. Craig Harris of IGN gave the game an 8.5/10, "Great".. Harris praised the game for having "faithfully retained the Donkey Kong arcade game's look and feel". His reaction is mild about the Donkey Kong boss levels, calling them "the ones with the least amount of creativity". He criticized the presentation, calling the sprites "awkward but admittedly well-animated 3D rendered" while the voice-overs from Mario and Donkey Kong are unnecessary, although not distracting. Despite these, he praises the game's faithfulness of the Game Boy Advance Donkey Kong games, with its fantastic level design and lasting appeal. Marcel van Duyn of Nintendolife has echoed some of IGN's statements, deeming the game to be "a worthy successor", giving the game an 8/10. As in the IGN review, Duyn criticized the game's pre-rendered sprites, saying that it "although it actually looks pretty good, it's a bit strange to see this style in a Nintendo title again after all this time." Duyn is disappointed that "the series has only had Lemmings-esque installments since", believing "the original formula is perfectly worthy of another day in the limelight." In a more critical review, Stephen Carvell of VideoGamer praises the game's visuals, but criticizes the game's level design, calling the reliance on the color-coded switches "tedious" and the later levels for using the same puzzles. He also criticized the Mini-Mario levels for having "appalling level design that smacks of a lack of ideas." He gave the game a 6/10. Game Boy Advance Craig Harris, IGN 8.5/10 "All of the well-established gameplay elements of the original have returned in new and fun platformer challenges with a decidedly different theme and flavor, taking advantage of the more powerful GBA platform. Strangely, Nintendo has seemingly ignored the game's roots instead of simply embracing them, playing off this game as a separate and "new" franchise instead of positioning it as what it really is: a continuation of one of the best, most recommended Game Boy titles in the system's library. Because the new design takes such a drastically different approach in its art style and presentation it feels just a little awkward to those who enjoyed the original Game Boy Donkey Kong and its faithful retroness. Beyond that element, though, there's a lot to enjoy in Mario vs. Donkey Kong, and its new production is still a can't-miss action title for the Game Boy Advance." Game Boy Advance Tom Bramwell, Eurogamer 8/10 "It won't come as anything new or inspiring to anybody who's tackled a DK title before, but it engages the brain in ways that we enjoy being probed, and for all its age the formula is still as sound as ever. Meanwhile, it's a new thrill for a younger generation of handheld owners, and has the potential to be a fantastic stocking filler for anybody who likes to haul out the console on a train or bus to school. It's not the most imaginative, it won't last forever, and we're not particularly sold on the pre-rendered visual approach (give us something from Yoshi's Island any day), but it's hard to argue with any game where every level feels like slotting in the last piece of a jigsaw puzzle." Game Boy Advance Jeff Gerstmann, GameSpot 8/10 "Mario vs. Donkey Kong is a standout game that fans of portable puzzles will have a good time with. It also plays the nostalgia card very well, making references all over the place. The music will occasionally go all the way back to the original Donkey Kong, including the classic "I've got a hammer" music. 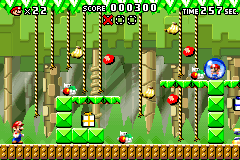 The game also includes vines and droppable fruit like in Donkey Kong Jr., acrobatic moves that are reminiscent of Super Mario 64, and the ability to stand on, pick up, and toss enemies just like in Super Mario Bros. 2. Both on its own and as a tribute to Mario's legacy, Mario vs. Donkey Kong does a great job." For this subject's image gallery, see Gallery:Mario vs. Donkey Kong. Mario breaking a Mini-Mario's crystal ball. Donkey Kong holding a barrel. Donkey Kong holding a Mini-Mario sack. 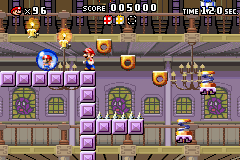 In Spooky House on the 3rd level, in the next room, Mario should go near the far right spring. Then, he should press the red button to have the Polterguy transform into a block, once the Polterguy is almost by the right side wall. If Mario jumps on the spring between the block and the wall, Mario may go off stage and lose a life. The music then stops and the game freezes, but the enemies are still moving. 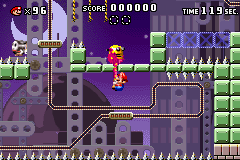 In Level x-3, if Mario gets crushed by a Kurasshā while standing on a moving platform, Mario will be flattened but will still follow the movements of the platform. This can cause Mario to continuously float in the air, and can also cause him to float upwards. At any time when the player is opening a locked door, they can press and to activate the map scrolling. When canceled, the end level jingle will still play as well as the door's sound effects, but Mario's (and the Mini Mario's in the Plus levels) sound effects will not. Mario vs. Donkey Kong - Mario: Ah, that Charles Martinet! Nice Italian boy. Mario vs. Donkey Kong - Mario: Oh yeah, don't forget to thank Mr. Miyamoto. "Come back here, you big monkey!" "Ah, that Charles Martinet! Nice Italian boy." "Oh yeah, don't forget to thank Mr. Miyamoto!" Donkey Kong (Arcade/NES game): The boot up song when starting a new game is briefly heard in the intro to the game. Donkey Kong (Game Boy): The game uses all gameplay elements from this game, although it has a very different story. Even the final battle is a recreation of that in Donkey Kong. Super Mario 64: Several of Mario's voice clips are recycled. Donkey Kong 64: Several of Donkey Kong's voice clips are recycled. Luigi's Mansion: Several of the Toads' voice clips are recycled. Super Smash Bros. Melee: Several of Mario's voice clips are recycled. Super Mario Sunshine: Several of the Toads' voice clips are recycled. 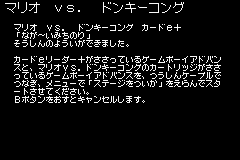 A small animation was added to the European and Japanese versions that was absent from the American version (which was built first). When Mario goes through the door, the Time Limit will be sucked in with him to make it more clear the remaining time will be added to the new Time Limit. While Donkey Kong's voice uses recycled clips of Grant Kirkhope's voice from Donkey Kong 64 in all versions of the game, the Japanese commercial for the game features Donkey Kong being voiced by Donkey Kong's current voice actor Takashi Nagasako. This page was last edited on April 18, 2019, at 19:52.